Discover the most beautiful places of Africa next year with the help of the newest pick of our deal hunters. Book this cheap flight from Chicago to Tanzania (Dar Es Salaam) for $891 r/t with taxes and fees included and have the vacation of your lifetime. The Thy Turkish Airlines flight our deal hunters have found is cheaper than any other offer out there. You can book this flight to Tanzania on Faredepot, but if you are a wise traveler you will also check some other sites from the box and compare their rates to see if you can find a better one than we did. Your flight will depart from Chicago O’Hare International Airport (ORD) on February 27 and fly back on March 6 from Dar Es Salaam International Airport (DAR). You will have a stop during the departing and the return flight in Istanbul, for 2 hours 45 minutes and for 2 hours 50 minutes respectively. 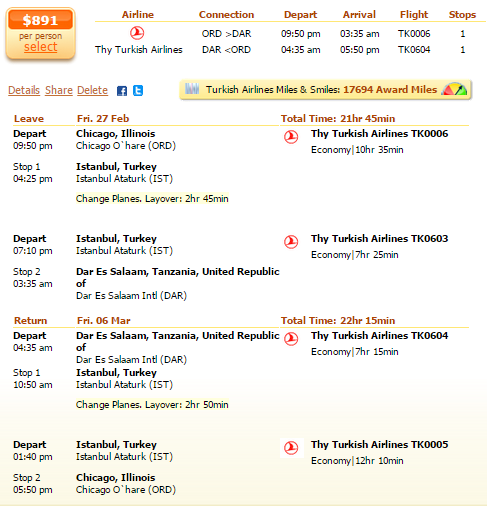 Note that booking this flight will bring you as many as 17,694 award miles from Turkish Airlines Miles and Smiles. The Turkish Airlines flight we have found costs $891 r/t and – as you can see in the table – the second best fare is $966 r/t, $75 more expensive. Check the cheapest flights to Tanzania below. This entry was posted on Saturday, December 27th, 2014 at 2:38 pm and is filed under Airfare Deals. You can follow any responses to this entry through the RSS 2.0 feed. You can leave a response, or trackback from your own site.